Flip thick steaks on the grill or serve up sauteed mushrooms and onions with this American Metalcraft LT14ST handy 8" x 3" solid turner. The blade is made of steel, making it reliable and easy to clean. With an overall length of 14", this turner will keep your hands a safe distance away from sizzling food, so that you won't get splattered by any hot grease. Durable and sturdy, use it for all of your heavy-duty tasks. The turner also has a wood handle, which makes for a sleek and comfortable grip. Does the job and does it well! Sturdy, feels nice in the hand, cleans up well, and has a nice fine edge that makes it easy to slide under a well-seared chop in a cast iron skillet or row of veggies on a baking sheet. I often find myself reaching for it when a normal spatula would do just because it performs so well. These are great solid turners they work great for all types of food items that need a turner. We will be purchasing more of these as we need them. Great product. Super quality, withholds the heat, have been in business for 10 years and this is by far the best turner i have used over time. I absolutely love this spatula. I use it with my cast iron griddle. I like it so much, that I actually leave it out resting on the griddle even when I'm not using it. It's so ultra thin, making it flexible but still sturdy and strong. The American Metalcraft eight inch by three inch solid turner with wood handle has been perfect for flipping everything from burgers to pancakes. I was very impressed with the non-flimsy design. I love that they can be left on the grill while cooking and not worry about melting plastic. Very versatile and I would recommend them to anyone. Good quality turner. We use this for everything on our flat grill and char grill and it holds up great. Cleans up easily as well. We have had for 3+ years and the corners are not bent at all. American metalcraft makes good metal kitchen products, and this turner fits the bill just right. Good full tang design, nice flex, and good price. Wish it had poly handles. I really like this turner. It is great for burgers on the grill or breakfast items on the griddle. The handle is securely attached and the it is very sturdy. It will last a long time. I really like this American Metalcraft LT14ST 8" x 3" Solid Turner - Wood Handle. The stainless steel blade is very strong and does not bend even with heavier products. The wood handle will prevent burning. I will purchase again. This is a good turner. It is holding up quite well. The price is so good that we can have several of them and still not break the bank.. This is the only spatula that when set down the handle stays of the grill.. Prevent burns and drops with this tool, sturdy and balanced.. THIS AMERICAN METALCRAFT 8" x 3" SOLID TURNER WITH A WOOD HANDLE IS A NICE ADDITION TO MY COOKING TOOLS AT A GREAT PRICE...VERY WELL MADE FOR FLIPPING BIGGER THINGS BUT ALSO CAN BE USED TO TRANSFER SMALL CAKES FOR PLATING UP+DECORATING...I HAND WASH MINE THO SO AS NOT TO DAMAGE THE LOOK OF THE WOOD HANDLE WHICH WOULD HAPPEN IF WASHED IN A DISHWASHER. These wood turners are very good and worked out great. The only reason I knocked a star off is cause one got dropped and the wood fell off. You would think it would be able to stand up to something that happens in a kitchen. This long and narrow turner does the job. We primarily use this during breakfast hour to quickly make and turn our smaller sausage patties. It is also been good to use serving our slices of sheet cake. It is put together well and is a breeze to clean. This is a great spatula for flat top cooking. The edge is sharp enough to easily slide under burgers. The wooden handle stays fairly cool as well. This wooden handled 8x2 turner is great for flipping burgers on a flattop griddle. It has lasted for years and has handled the heat of the kitchen and plenty of runs through dish. Not a bad spatula for the price. Great for the grill because the corners and edges are rather sharp. Not recommended for use taking items off of trays that are lined with parchment/baking paper especially for fast service or movement. The spatula cuts into the paper. Best turner for such a low price. It is designed to balance on the grill without tipping over which is helpful. Next time we will purchase the 4" wide turner for our larger melts. Very satisfied. This turner is simple yet effective and they last long and hold up well. they have good weight and feel good in my hands. I like them better then the more expensive ones. Bought this for the grill. Works great loading the meat .onions ,cheese and peppers on the buns. square corners fit the griddle with no mess. great purchase has been great item for the business. and it is a perfect size to for the grill, and made of long lasting material. This 8" x 3" solid turner with wood handle is a great product. The size is perfect for flipping burgers, pancakes etc. The wood handle allows for a good grip. Handwash though due to the wood. I like this product. High quality turner with solid corners on it. I would recommend one with rounded corners though as this can be a bit hard to use with certain pans and stoves. On a grill though, it works awesome. Good, large, thick turner with a solid wood handle so it doesn't heat up. A must-have for the flattop or the grill. Makes cheesesteaks and other sandwiches a breeze. Solid performance! Not too heavy like some others are yet it provides a good solid flip and consistent performance for anyone who does a lot of flat-top use. This is a great turner for doing general turning tasks in the kitchen. It is sturdy, and seems well constructed. I like the look of the wood grain. We have used many different types of turners in the past. this turner appears to be the best so far. its light weight, yet sturdy enough to handle anything on the grill. This 8" x 3" solid turner with wood handle is pefect for flipping burgers, grilled cheeses or any other thing that needs to be turned. These are the perfect size for just about everything. Burgers, cheesesteaks, eggs, etc. Clean up easily, don't bend or rust, and the handles are nice and sturdy. Quality turner at a great price. This item gets lots of use every day on our restaurant grilltop and it held up very well. Cleans up easilt. Great turner! Truly is solid. While flexible is good for some things, the solid turner works best for most of our foods. This size holds 2-3 eggs at a time. I seen this turner being used at the Charley's Grilled Subs place and I knew that I gotta get it. I quickly found it here on Web Restaurant Store and was so eager to try it out that I could not wait. When it finally arrived I immediately gave it a try and found out how comfortable it is to work with. the 8-inch area is really useful for most turning and scooping applications. At Charley's Grilled Subs they use it to flip and scoop the steaks onto the hoagie bread. The turner that I received has rounded edge, as opposed to the straight edge as seen in the product photo. The shorter handles are perfect for more control when used for chopping and cutting on the flat tops. 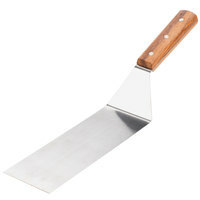 We also use these for flipping pancakes on a daily bases. This is the only turner to buy if you make sub sandwiches that may be loaded with grilled onions and such. It's the perfect length of sub buns and makes it easy to load up and quickly place onto the sub! The best turner out there! Great price too!